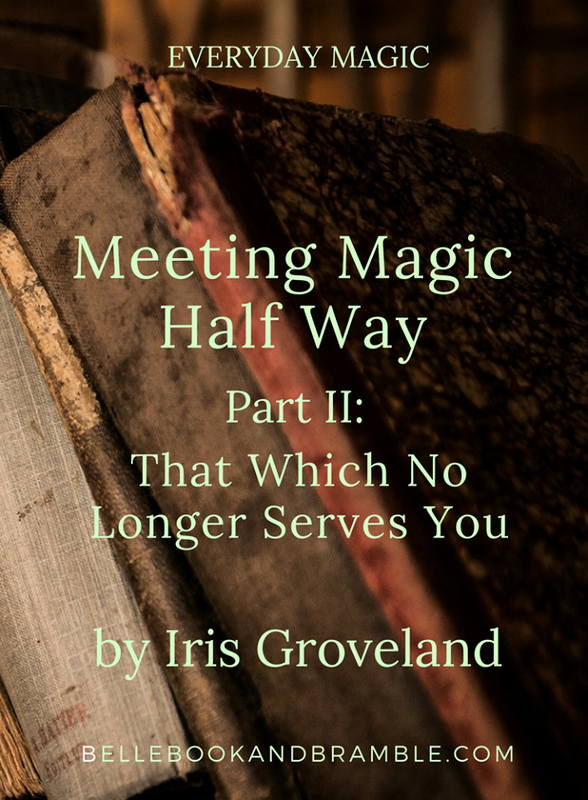 Please welcome back guest blogger Iris Groveland for more in her Meeting Magic Half Way series! I took a yoga class where the teacher said something that completely changed how I look at not only my poses and what I was capable of in class, but, as cheesy as it sounds, many aspects of my life in general. “Do what serves you.” It sounds simple enough, really. Don’t do what doesn’t benefit you. But the simplicity of that is perhaps what makes it so easy to miss as a decision-making concept. When we talk about meeting magic half way in regards to cleaning up our space and clearing out perceived or actual demons, what we’re really talking about is clearing out old, stale, or negative energy in order to create a space where we can really create, grow and thrive, both physically and metaphysically. Cleaning up the dust and the cat litter and putting toys away is great, but when we take it a step further, we’re really talking about is honest self-examination. We talked about making sure we clean our mirrors to allow us an opportunity for clear reflection and in that spirit, we’re going to be using reflection to help us deal with the demons that might be weighing us down without our knowledge: Our stuff. De-cluttering can be an inclusive part of your collective cleaning/cleansing process or it can easily be an independent exercise, as it does require its own, unique sort of energy and intention. Be aware that it’s not something that has to happen all in one go, either. It is a steadily flowing thing, like a small stream that’s gently bubbling away in the background, reminding you to stay, as my Drill Sergeant was keen on saying, “flexible as water.” Stay mindful and stay present, just like you would in a ritual, but be aware of the flow of your own energy. Be forceful when you need to, but don’t rush. Keep your intention clear or, as with magic, results may vary, and not always in your favor. We’re fighting demons, people. Keep your head on a swivel. MENTAL/EMOTIONAL HEALTH DISCLAIMER: My experience in this comes from years of moving (as many young adults do in the beginning of their independent lives), often in small, shared spaces, and the loss of my parents and my last grandparent over three years’ time. My own work was as much the process of grieving as it was the physical process of reducing, and doing so responsibly. I cannot say that I don’t have regrets or that circumstances were always such that I could take my time. However, even without the loss of someone, there will be no uncertain work of real, true blue LETTING GO on all levels, so I want to take a moment to honor the work we will be doing. As you go forth, the balancing act will be between staying on task and being gentle with yourself. Just like going into battle, a blind, headlong rush usually just ends up in injury. Take your time. Strategize. Set goals. Make lists. One day at a time. One box at a time. You will emerge stronger, but not if you stretch yourself too far, too fast. Just like you ground and center before a ritual, make sure you take the time to do the same, as it will seem overwhelming at times. As we mentioned, this is going to be a time of reflection that may very well border on meditation. There is not necessarily any right or wrong place to start, and some points will be more obvious or easier than others. Clothes that your kids have outgrown is too easy and, like we talked about, something that happens on a fairly regular basis. But if we’re talking about our magical lives, or taking care of our spirit, there are questions we need to ask ourselves, and these questions easily double for the mundane stuff in our “normal” lives. Does this object hold the same meaning for me as when I first acquired it? How has that meaning changed? Does it feel empty? Is there sorrow or any negative association attached to this item? Is there any hint of hesitancy with the item? Did I acquire it because I thought I had to? What did I acquire as a one-time use only item? This is a really good question when going through your magical tool box and altar set ups. When was the last time I actually used this item? This is where I will play with timelines. If I honestly cannot remember the last time I wore/used something, chances are that it’s only taking up space. Or, if I’m still waffling, I’ll set a deadline. I’ll actually speak to the item: “OK, you. If I haven’t used/worn you by _x-amount of time/date/season_, then you’ve got to go. Is my sacred space dirty because there are so many things on it that the task of cleaning it starts to feel like way too much work? (This is a very big red flag that some simplification is in order.) Your sacred space could be your kitchen, your desk, your craft table, your garden shed, or something as simple as a windowsill. It can be a good starting point as any place that should make you say “Ahhhh,” in terms of peaceful relief, but instead makes you say, “Ugh,” as though you just saw your ex in the grocery store. If at any point, you open a box or a closet and hear yourself saying, “Oh! I forgot I even had this,” this is a clue. If you forgot you even had it, chances are better than not that you don’t need it. You may often be mired down by what others will tell you, and like wading through a thick swamp, this also takes effort and dedication to navigate. It will be exhausting at times, requiring a lot of smiling and nodding while you do what serves you behind the scenes of others’ expectations. For example, I had (and still do) an attic full of antiques after losing so many family members over such a short time. My ears were filled with “Some of those might be valuable, so don’t just throw them away.” From a magical perspective, you may get a lot of opinions about the “proper” way to dispose of any kind of semi-sacred item. Tracking down the value and finding a buyer for every antique bud vase I inherited could be a full time job on its own. Likewise, it could be that your sacred items are only as sacred as the intention you had assigned to them. To someone looking at it on a shelf at the local thrift shop, it’s just a figurine. It seriously is. Sentimental value is a hard field of play, but again, honest introspection is your battle buddy here. Stuffed animals, your children’s drawings and school projects, your hair band concert t-shirts, your grandmother’s costume jewelry; all of it full of wonderful associations, probably, but how many times have you moved that storage bag and never unpacked it, let alone wore any of it? I know those are your grandma’s sweaters, but maybe just keep one or two and donate the rest. My mom worked at a hardware store for thirty years and was a gardener. Her wardrobe consisted of worn, stained Carhartt jeans and logoed shirts from the store. I had someone take the jeans and work shirts and make them into a quilt for myself and my niece and nephew. When we were cleaning out my dad’s house, he had a flannel shirt collection that would have stood up against any Cabella’s catalog. My brother and I each took one. Grandma’s costume jewelry went to my niece so she could start her dress-up stash. Without children of my own, there is an active thought that I will serve others best by not leaving a pile of stuff to sort through to take to the dump. But even with a family to keep in mind, we need to be honest about perceived value vs. real value. There is a lot of good honest advice found in an article linked here: http://www.nextavenue.org/nobody-wants-parents-stuff/. What does all this have to do with your demons and your magical life? A clean space means a free flow of energy. A freed up space in a closet will mean freed up space in your head. Dumping that box will mean cleaning out a dusty corner of your heart you’d been avoiding. Coming face to face with our past can mean staring into the eyes of the things holding you back. What have you gotten rid of that made you feel free at last? 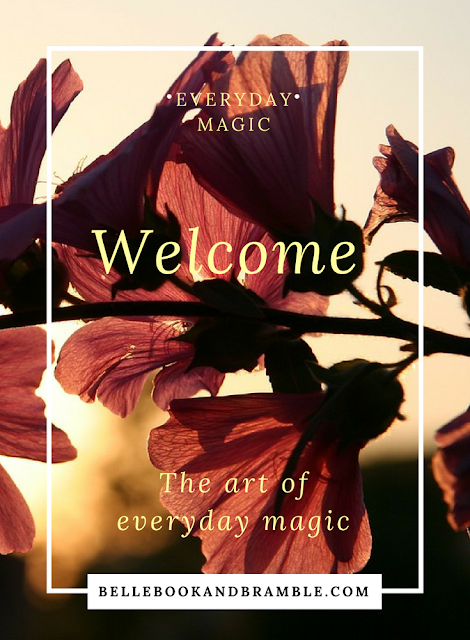 In the next part of this series, Belle and I invite you to take part in a conversation regarding housekeeping of our magical tools and other management strategies for our sacred accoutrement. She gave you great ideas for sprucing up your Spring altar, so we’re going to use that as a spring board (oh, puh intended, why not?) to talk about the general upkeep issues we face when talking about cleaning sacred items in a mundane fashion, or what it means to acquire second-hand tools. I have been purging things lately. Room by room. More than just my usual spring cleaning but bags and boxes are being carted off to Goodwill. Time to let go.